“It is amazing that many women in Africa continue to use hoes to till the soil in their small scale farms in communities in Africa in this age of technological advancement,” wondered Nkosazana Dlamini Zuma as she addresses officials at the launch of the African Renewable Energy Initiative at COP21 in Paris, France. “We are calling on the President of the African Development Bank to ensure that funding for the purchase of such archaic working tools for women becomes history,’’ Zuma pleaded. The good news is that the African Development Bank had in store its plan for a transformational change for women that will put the use of rudimentary working tools still used by many poor communities in Africa at bay, the President of the African Development Bank, Akinwumi Adesina announced. He indicated that climate-related disasters are taking a big toll on agriculture production in Africa especially and women remain the biggest victims of the climate calamity given their key role in agriculture production. He warned that if concrete actions are not taken to protect the women farmers in their business the effects of climate change can wipe out decades of development gains and put food security in peril in Africa. ‘Agriculture remains Africa’s economic main stay contributing significantly to the GDP of many countries. 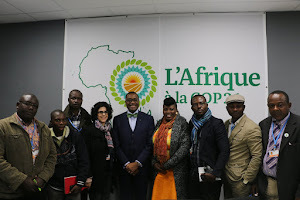 The success of the outcome of COP21 will not be obtained without any concrete action addressing issues of agriculture in Africa’’ pointed out AfDB President Akinwumi Adesina at the African Pavillon launch on Tuesday December 1, 2015. It is against this backdrop that he announced AfDB project dubbed,’’ Affirmative Finance Action for Women” to support women in agriculture business to boost the resilience of this vulnerable group in particular and other vulnerable communities in general. The impacts of climate change he said was intensifying with droughts and floods affecting ecosystems and food and water supplies in Africa putting the agricultural activities of women in difficulties and thus depriving of solid economic footing. Economic losses from disasters have increased by more than 50 percent over the past decade, he noted. The hardest-hit are poor people, including small-scale farmers especially women. "As climate impacts increase we see women and children virtually helpless. It is time we find lasting solutions to these challenges, “he said at the U.N. climate talks in Paris. "It is imperative that we strengthen resilience and build the adaptive capacities of women by providing financial support to agric-business initiatives,” Akinwumi said. AfDB announced the allocation of some 300 billion dollars to support the project to boost innovative agriculture project by women. “Agriculture is business and we must address the challenges involved from a business perspective,” he noted. President Bony Yayi of Benin equally highlighted the need for an ambitious accord to address agriculture difficulties in Africa. “The future of the world depends on Africa, the breadbasket with huge food production potential. Energy and water is therefore important in transforming Africa’s agriculture, the main stay of most of its economies,’ Boni Yayi said at the presentation of the African Renewable Energy Initiative. African officials nonetheless pledge for fostering of partnership, bringing together existing and mobilizing new international support for people oriented agricultural business projects for the future.